On the Beach is a 2000 apocalyptic made-for-television film directed by Russell Mulcahy and starring Armand Assante, Bryan Brown, and Rachel Ward. It was originally aired on Showtime. The film is a remake of a 1959 film, which was also based on the 1957 novel by Nevil Shute, but updates the setting of the story to the film's then-future of 2005, starting with placing the crew on the fictional Los Angeles-class submarine, USS Charleston (SSN-704). USS Charleston (SSN-704) is equipped with a caterpillar drive and is on station following a nuclear exchange, under the command of Dwight Towers. The nuclear war which contaminated the northern hemisphere was preceded by a standoff between the United States and China after the latter blockaded and later invaded Taiwan. Both countries are destroyed, as is most of the world. The submarine crew finds refuge in Melbourne, Australia which the radioactive fallout has not yet reached (though radio communications with several radio operators farther north than Australia indicate that radiation has reached their countries and will be in Australia in a few months). Towers places his vessel under the command of the Royal Australian Navy and is summoned to attend a briefing. When Towers (Armand Assante), Australian scientist Julian Osborne (Bryan Brown) and Australian liaison officer Peter Holmes (Grant Bowler) find out there is an automated digital broadcast coming from Alaska in the Northern Hemisphere, the submarine is sent to investigate. En route, the submarine surfaces in San Francisco, where the Golden Gate Bridge has collapsed and the city shoreline is in ruins. A crew member who is from San Francisco abandons ship, planning on dying in his home city, and is left by his shipmates after it is argued that the length of time he has spent outside has already made him sick with radiation sickness. Upon reaching Alaska, Towers and his executive officer go ashore to find no survivors. Entering a house and seeing a dead family huddled on a bed, Towers thinks of his own family and what they must have gone through. The source of the automated digital broadcast is traced to a television station whose broadcast, Towers and his executive officer discover, comes from a solar-powered laptop trying to broadcast a documentary via satellite. While in Alaska, Towers' executive officer accidentally rips his suit and hides the fact that he is becoming sicker and sicker. Upon the Charleston's return to Melbourne, he collapses and is diagnosed with terminal radiation sickness. Towers attends his old friend in his dying days and ultimately, at his request, euthanizes the man as his deteriorating condition causes him to experience extreme suffering. Towers returns to Melbourne, where Moira Davidson (Rachel Ward) is waiting for him. Realizing the inevitable nuclear cloud will reach Australia, their impending doom begins to unravel the social fabric of the survivors in Australia and anarchy and chaos erupt. Some choose to live their final weeks recklessly in a deadly car race while others seek a more peaceful means to face the end of their lives. Holmes and his wife (Jacqueline McKenzie) seek solace in their love for each other as Towers and Moira decide become closer. As radiation sickness befalls Melbourne, people begin lining up for suicide pills. After Mary and their daughter Jenny fall ill, Peter and his family share a final moment before taking their doses together, Peter sorrowfully injecting his daughter. Osborne races recklessly on a racetrack, ending with Osborne purposefully crashing his car for a fiery death. With most of the Charleston's crew developing advanced radiation sickness, the crew requests to take the submarine in one final voyage to San Francisco. Though they know they are unlikely to survive the trip, the crew wishes to die together on the Charleston, the only real home they have left. Towers agrees and apparently abandons Moira to be with his crew. As Moira watches the Charleston sail away, Towers unexpectedly joins her, having chosen to die with Moira rather than his crew. In the film, the Morse code signal picked up by the submarine crew in the original novel and film was updated to an automated digital broadcast powered by a solar-powered laptop computer. The film's picture of human behaviour is darker and more pessimistic than in the original 1959 adaptation, in which social order and manners do not collapse. Alterations from the book and original film adaptation are made, including an ending differing from both the novel and film in that the submarine commander chooses to die with his newfound love instead of scuttling the submarine beyond Australian territorial waters (as in the novel) or attempting to return with his crew to the United States (as in the earlier film). In this version, the Golden Gate Bridge has collapsed and the city shoreline is in ruins, indicating an adjacent nuclear detonation, as in the book but not the first film version. The film ends with the reunion of Towers and Moira while their implied suicides occurring offscreen, as did the original version of Moira in the first film. Unlike the first film, there is no final postmortem scene of deserted Melbourne streets, with the absence of human life depicted. This is the way the world ends / This is the way the world ends / This is the way the world ends / Not with a bang but a whimper. The film received mixed reviews because with its three-hour account of impending doom, reviewers considered it "slow going". Some film reviewers still found aspects to praise, however. Richard Scheib, the Science Fiction, Horror and Fantasy Film Review critic saw the film as benefiting from the lengthier timeline, "The mini-series certainly has the luxury to pad the story out and tell it with more length than the film did. As a result there is a greater degree of emotional resonance to the characters than the 1959 film had ... Mostly the mini-series works satisfyingly as a romantic drama, which it does reasonably depending on the extent to which one enjoys these things. Crucially though the mini-series does manage to work as science-fiction and Russell Mulcahy delivers some impressive images of the aftermath of the nuclear holocaust. There are some fine scenes with Armand Assante and the submarine crew walking through the ruins of Anchorage discovering how the people there committed suicide en masse, and some excellent digital effects during the periscope tour of the ruins of San Francisco." 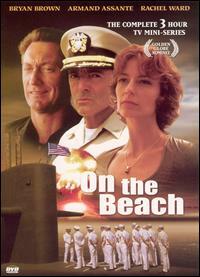 On the Beach received two Golden Globe award nominations and was nominated as Best Miniseries or Television Film. Rachel Ward was nominated in the Best Performance by an Actress in a Mini-Series or Motion Picture Made for Television category for her role as Moira Davidson. ^ King, Susan. "Together Again for Apocalypse 'On the Beach'; Rachel Ward and Bryan Brown team on screen for just the second time since marrying 17 years ago. "Los Angeles Times, 26 May 2000, p. ESPN F1. Retrieved 11 January 2015. ^ Moliltorisz, Sacha. "TV & Radio: On the Beach." The Sydney Morning Herald , 19 April 2007. Retrieved 11 January 2015. ^ a b Kronke, David. "'Beach': It's the End of the World As We Know It." Los Angeles Daily News, 28 May 2000. Retrieved 11 January 2015. ^ Turegano, Preston. "Beach's passion doesn't run deep, as radioactive love boat founders." U-T San Diego, 28 May 2000, p. TV3. Retrieved 11 January 2015. ^ Whitman, Walt. "On the Beach at Night." portablepoetry.com. Retrieved 11 May 2012. Retrieved 11 January 2015. ^ Shute 1957, p. verso. ^ "Royal Navy Diction & Slang." Hmsrichmond.org. Retrieved 11 January 2015. ^ "'On the Beach' Revival is Slow Going Until the End." Akron Beacon Journal, 28 May 2000, p. ESPN F1. Retrieved 11 January 2015. ^ Scheib, Richard. "On the Beach." moria.co. Retrieved 11 January 2015. ^ "Golden Globes announce TV, film award nominees." Milwaukee Journal Sentinel (Associated Press), 22 December 2000, p. 8B. Retrieved 11 January 2015. Shute, Nevil. On The Beach. New York: William Morrow and Company, 1989, First edition 1957. ISBN 978-0-34531-148-1. This page was last edited on 15 February 2019, at 18:12 (UTC).